Al's first compilation to actually chart in Billboard. The only single album to contain "Headline News" and the single version of "UHF." 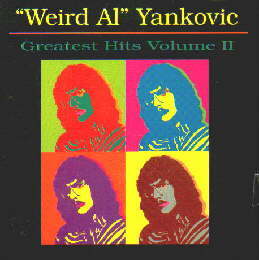 With the exceptions of "Polka Your Eyes Out" and "Yoda," all of the songs on this compilation were issued as singles. Released in Japan on December 16, 1994. Even though this compilation contains three songs that were released before the first Greatest Hits album, it mysteriously overlooks "I Love Rocky Road." "I Love Rocky Road" is the only pre-Bad Hair Day video single to not be included on one of the two Greatest Hits albums. RHINO-STYLE TRACK NOTES What's this?? STILL NEED THIS ALBUM? ORDER IT FROM AMAZON! CLICK HERE TO DOWNLOAD THE ALBUM FROM AMAZON! CLICK HERE TO DOWNLOAD THE ALBUM FROM ITUNES! CLICK HERE TO ORDER THE AUSTRALIAN ISSUE! This page was last updated November 23, 2009. Scan of Yoda sticker courtesy of Dave "Elvis" Rossi. Greatest Hits Volume II ©1994 Scotti Bros. Records. ©1999 Way Moby/Volcano Entertainment III.